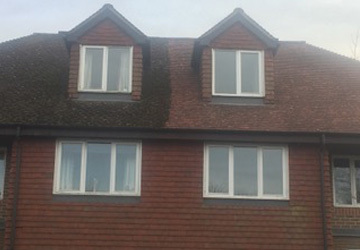 A P Benson Roofing & Building has been providing top-rated soffits and fascias, flat roof repairs, and chimney repairs among other roofing services to our customers in Woking for over thirty-five years. We have a reputation for excellence that sets us ahead of the field compared to other roofing companies in the Woking area. Here is a sample of the services we offer our clients. As one of the premier roofing companies in the area, you know your roof is in the safest possible hands when you hire A P Benson Roofing & Building. No matter if you want a pitched or a flat roof installed, or an existing roof repaired, our team of roofers will get the job done. 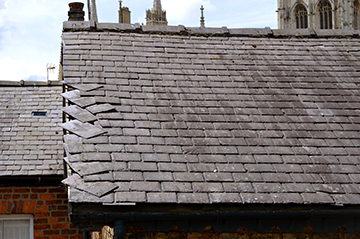 A lot of our work in Woking is taken up with roof repairs: everything from missing slates and cracked lead work to loose flashing and serious storm damage. Our team of accredited roofers are well-versed in dealing with flat roofs. Whether you’re looking to have a new flat roof installed on an extension, or an existing flat roof repaired, we can handle it. 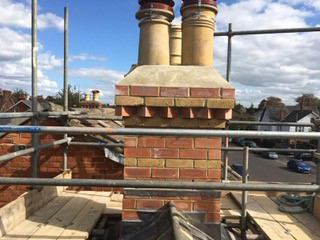 It is important that chimney repairs take place immediately, whether the stack itself is in use or not. Storm damage and even general wear and tear can lead to cracks in the brickwork or mortar, which could result in serious damage. Soffits and fascias form the roofline that runs around the edge of your house, supporting the eaves and guttering. As such, it is vital that they are well maintained and that any repairs are completed immediately. Fortunately, our team of roofing experts bring a wealth of experience in soffits and fascias to every roofline job they take on. As well as pitched and flat roof repairs, soffits and fascias, and chimney repairs, our highly-skilled roofers also do new roof installations, gutter repairs and replacements, moss removal, pointing and re-pointing and lead work among other services. Based in Guildford, we have a crack team of roofers who operate across most of Surrey, including Chobham, Godalming, Farnham and, of course, Woking. We have been trading for almost four decades, delivering a first-rate service to our Woking customers. Our team of accredited roofers have over 100 years of experience between them, which they bring to every job.